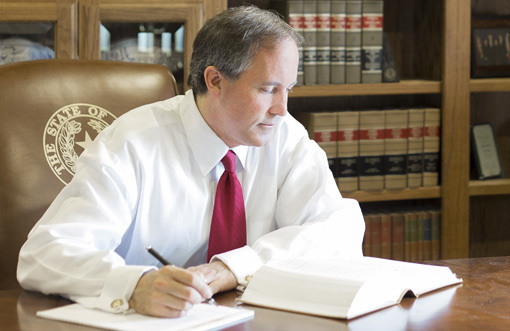 On November 4, 2014, when the 51-year-old Ken Paxton was triumphantly elected Attorney General of Texas, defeating his Democrat opponent, the euphoniously named Sam Houston, by over 20 percentage points, the conservative movement in the Lone Star State had a new rising star. Paxton’s enemies were worried; the Tea Party favorite, an impressive University of Virginia law school graduate, seemed bound for the Governor’s mansion, a prospect that made the state’s centrist GOP Establishment aghast. Paxton’s political career had been nothing short of meteoric. First elected to public office in 2002 with the support of grass-roots activists and evangelicals, Paxton represented his suburban Dallas district in the Texas House of Representatives for a decade before winning a coveted promotion to the exclusive 31-member Texas Senate in 2012.